Friends. A new Myrsol line is born. 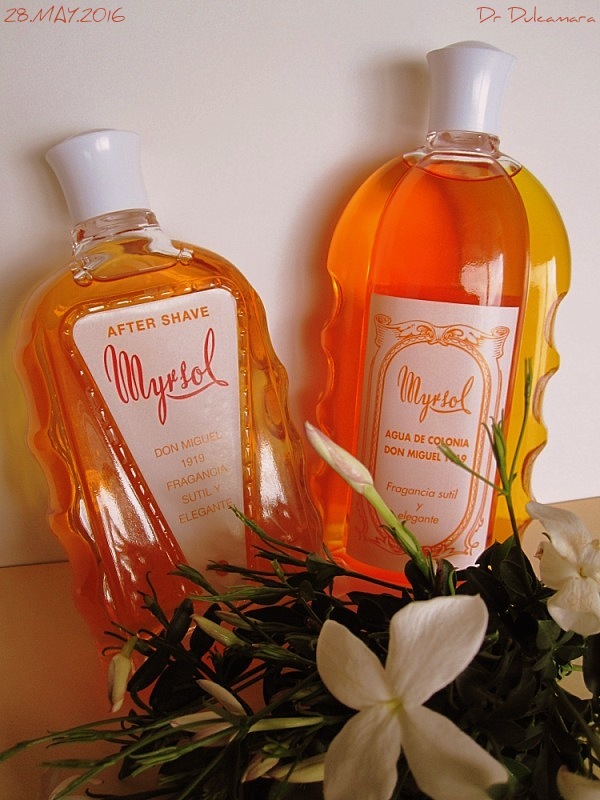 In tribute to the founder of Myrsol. It is a formula from the formulas book. A book that I have had on hand, with the handwritten formulas from Mr Miquel. 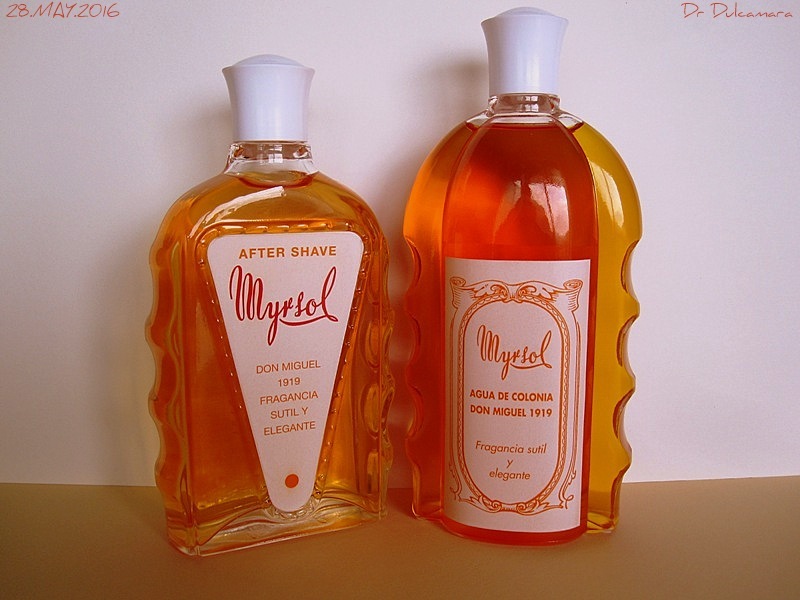 The aftershave was made in the 60s about, but since then has not become manufactured. The formula has been updated very very subtly. Cologne really is a completely new product. And it will also be the cream/shaving soap in jars of 200 grams, which is already in preparation. 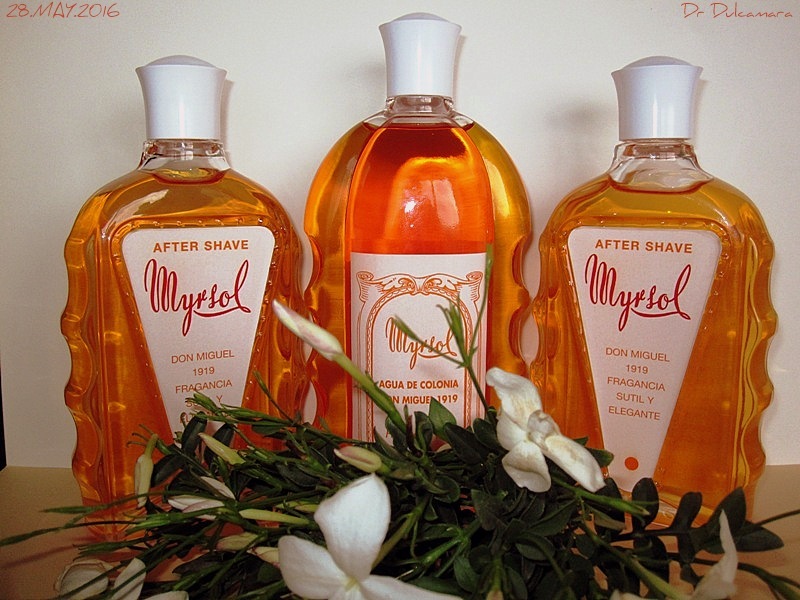 If you like the fragrance, the line probably shall be extended with a bath gel or shampoo. I show the three bottles labeled only for now, that are in my possession. They will go bottling and distributing in the coming days/weeks. The aroma is floral: JASMINE is the main note. Juan, thank you for telling us about this new product. 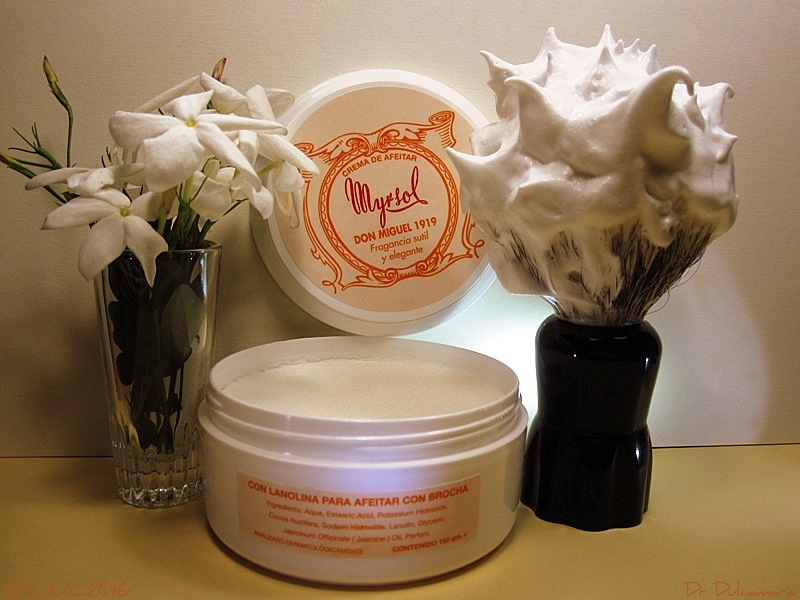 Will the cream shaving soap be the same ingredients as the current soap in the 1000g soap, Crema de Afietar with lanolin with a new fragrance but in a smaller quantity? brothers wrote: Juan, thank you for telling us about this new product. 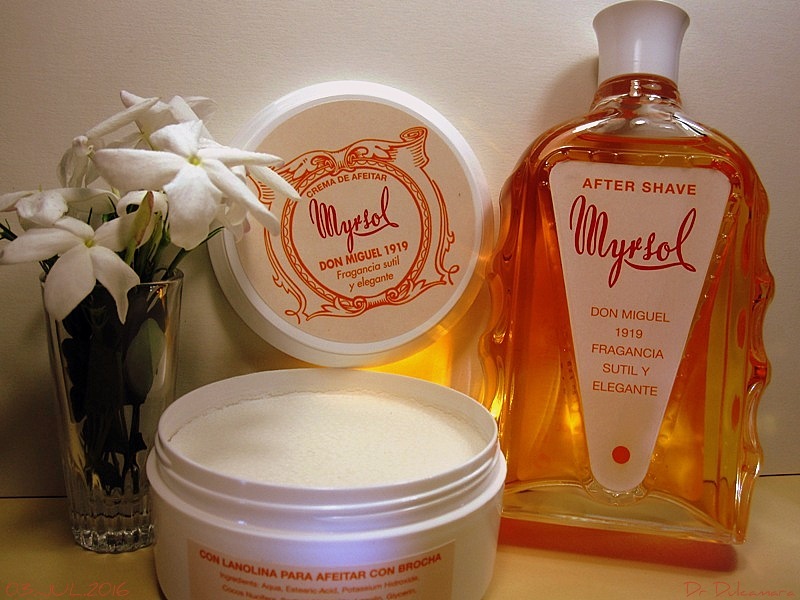 Will the cream shaving soap be the same ingredients as the current soap in the 1000g soap, Crema de Afietar with lanolin with a new fragrance but in a smaller quantity? Yes. It performs wonderfully. 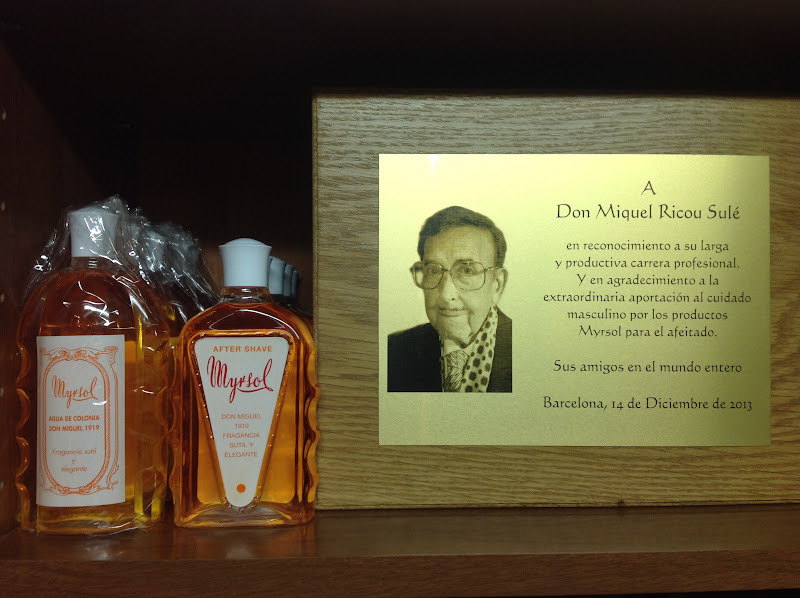 I do not like the current aroma, but I guess with the Jasmine aroma of the Don Miguel 1919 will be nice. For us, the one kilo is not practical, but this tin 200 grams will be useful. Fantastic !...I'll take mine in glass por favor...Also , how did you get Senor Ricou's formula book , from his son ?? ?...I bet there are more vintage formulas the boys will love ! For this product I will make an exception and allow myself the pleasure of buying yet another shaving product. 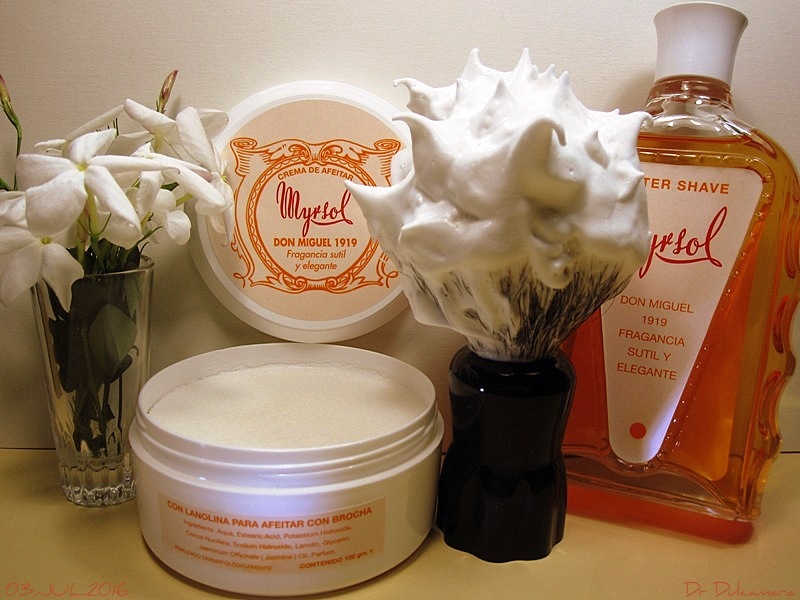 I hope someone will let us (me) know when and where I can get my hands on the new shaving soap cream. malocchio wrote: Fantastic !...I'll take mine in glass por favor...Also , how did you get Senor Ricou's formula book , from his son ?? ?...I bet there are more vintage formulas the boys will love ! Ha, ha. I have had the book in hands. His grandson showed it to me. 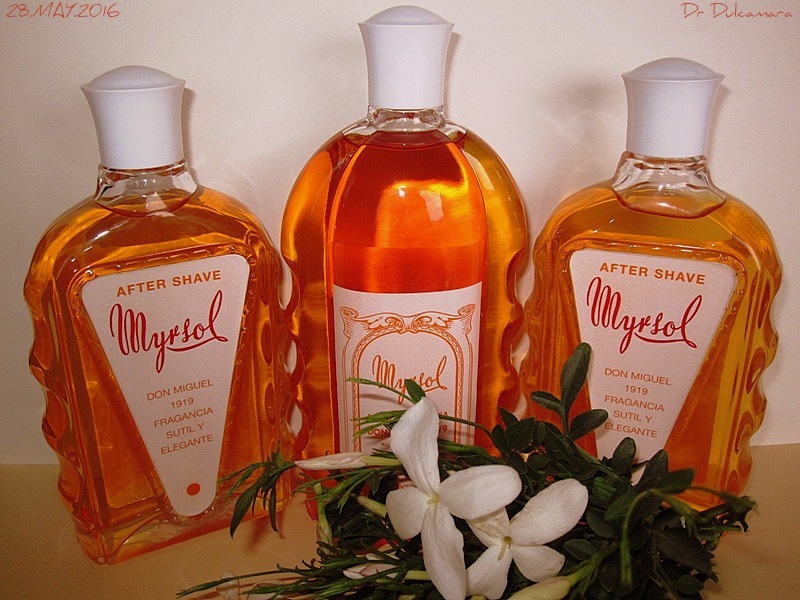 brothers wrote: For this product I will make an exception and allow myself the pleasure of buying yet another shaving product. 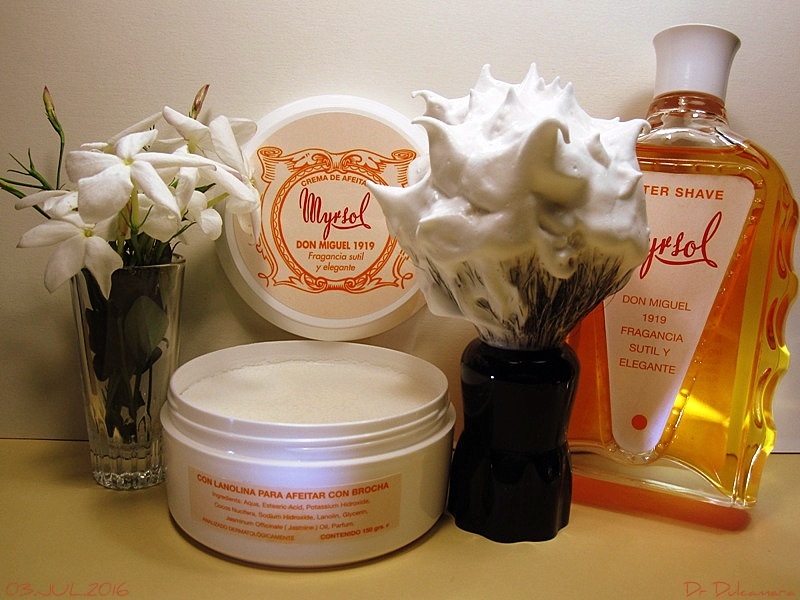 I hope someone will let us (me) know when and where I can get my hands on the new shaving soap cream. I guess the usual supply chain, friend. That's good to know. My favorite Spanish vendor is Juan @ Gifts & Care. 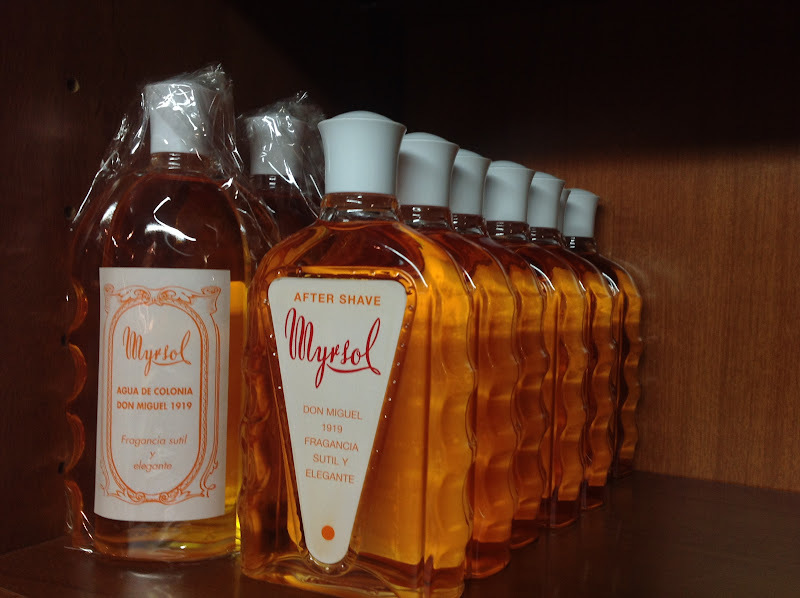 On Friday, I went to chit chat with my friends from Myrsol, and look what was on the shelf. I received an email from Gifts & Care notifying me that the new fragrance is in stock right now. They are checking on availability of the new Crema Afeitado shaving cream in the 200g jar, with the Jasmine fragrance. 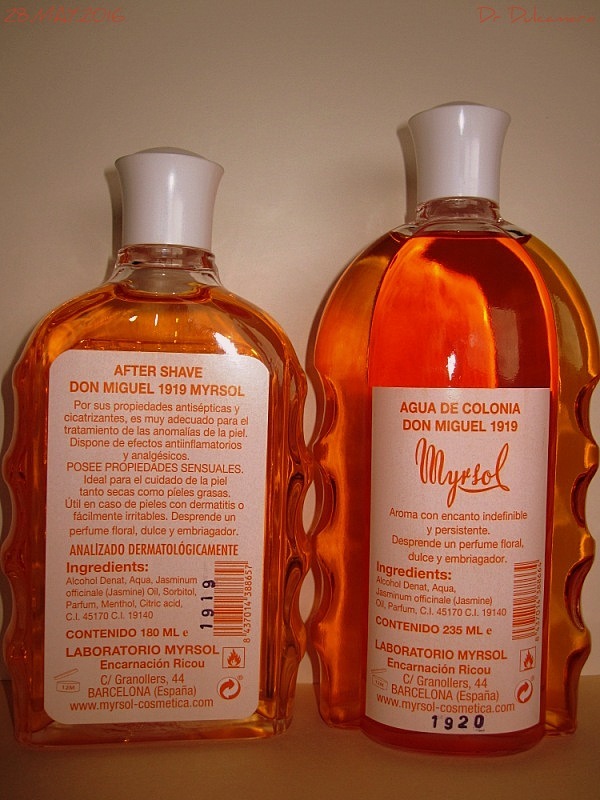 Although I've only used one Myrsol product before - Agua Balsamica - it is good enough that I decided to try this new one. 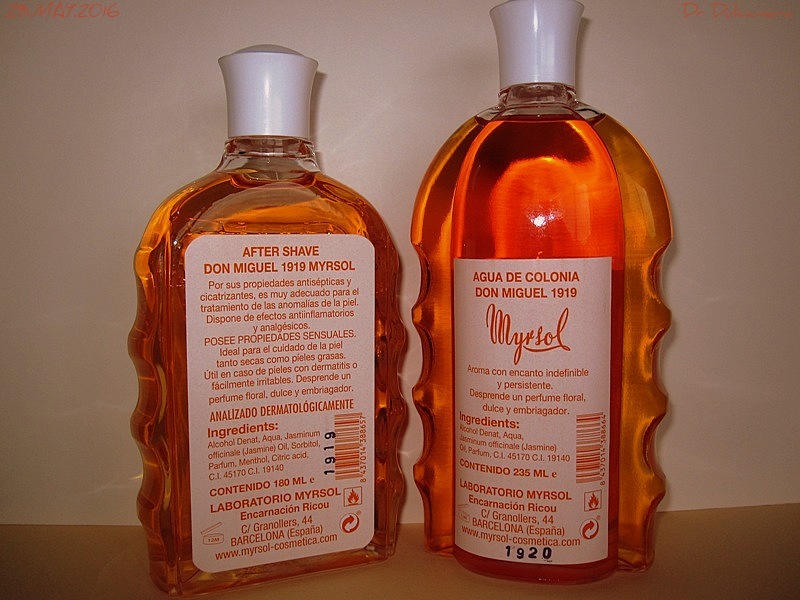 Don Miguel is completely different from Balsamica other than the packaging and base ingredients. 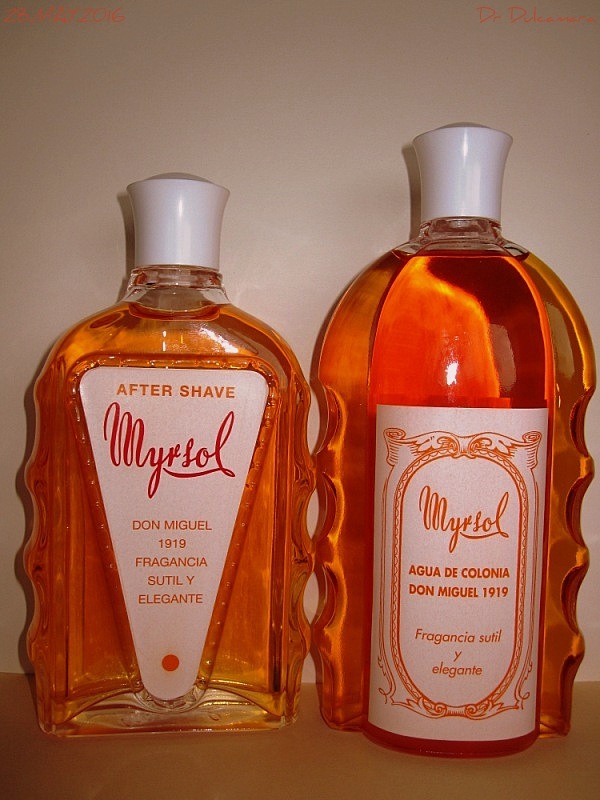 Don Miguel is heavily loaded with a sweet jasmine scent and just enough menthol to feel a tingle on a freshly shaved face but not noticable to me in the scent. The jasmine seems to be of good quality and on my wrist test it lasts a couple of hours before tapering off. 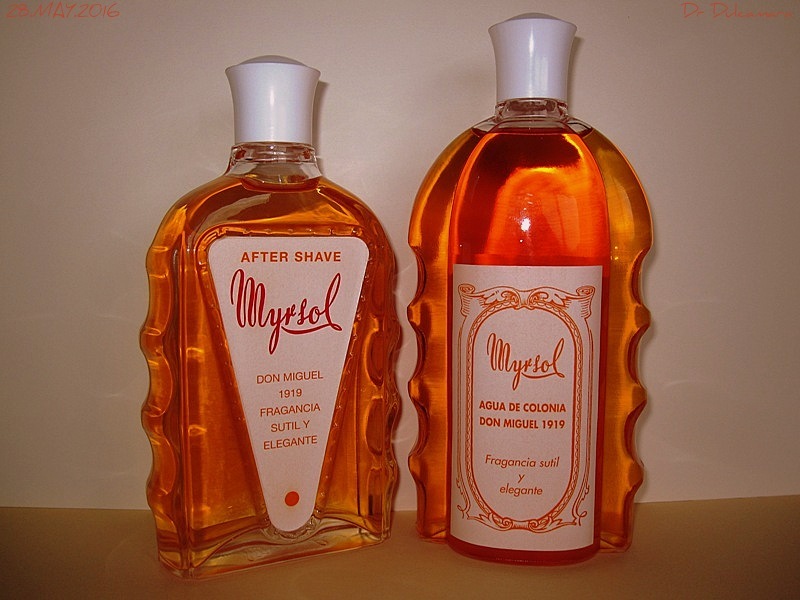 Overall I would rate this as a very pleasant summer after shave. The scent does last a while so this needs to be factored in when selecting a cologne. I will probably use it on days when I'm home so that I can enjoy the the jasmine and then add something else when it subsides. Glad to read you like it, friend. I am enjoying mine. Friend, there is not eucalyptus in it. They are in a mistake. No eucalyptus there. I know. 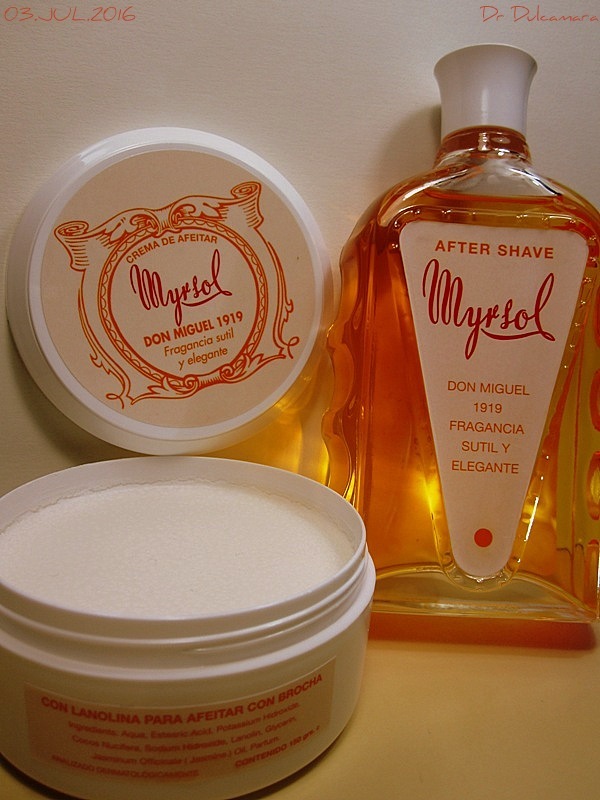 Friends, Myrsol Don Miguel 1919 Shaving Cream is ready. And I like it.